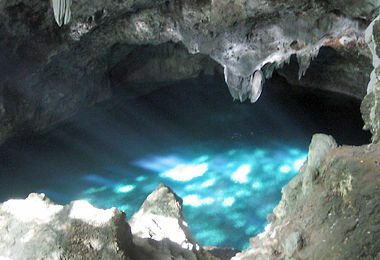 The Cave of the Three Eyes (Cueva de los Tres Ojos) is a collapsed cave featuring three small pools located on the outskirts of Santo Domingo. It was formed centuries ago when some underground caves collapsed, forming a bowl-shaped depression. Originally, it was very difficult to get into and out of the sunken area: locals would tie a rope to a tree and climb down to swim in the three pools. Occasionally, locals would be unable to climb back up and needed to be rescued! Today, there is a stairway cut into the rock for easy access. In the sunken area, there is not much still underground. There are trees and plants and the place has the feel of an island of tranquility in the midst of the city. The first of the three pools is named “the sulfur pool” and is a brilliant blue color when lit by direct sunlight. Someone has stocked it with turtles for some unknown reason. The second is called “the refrigerator” because it never gets any sun and is quite cool: this one has a small boat on it that can be taken, for extra charge, to explore some more caves. The third, “the women’s pool” is sort of isolated, down some steep steps: apparently this one used to be where women would swim so the men wouldn’t gawk at them. It is no longer possible to swim in the caves, but the visit is quite nice. The worst part, without a doubt, is the hyper-aggressive souvenir vendors that swarm around you as you enter and leave the caves: you’ll wish you had a baseball bat – or perhaps a crucifix and some garlic – to fight them off. If they were any more pushy, they’d be muggers. If you’re coming on an organized tour, the guide will offer you a little protection, but if you come in a cab, you’re on your own. The cave is located in eastern Santo Domingo, inside Parque Mirador del Este, off of Carretera de las Americas, not very far from downtown Santo Domingo. Entrance cost seems to be negotiable, and varies depending on whether or not you want to take the little boat trip.